This sample 15-day (14 nights) itinerary covers Ljubljana, Rovinj, Plitvice, Trogir, Hvar and Dubrovnik. These are some of the hidden gems of Europe, and each is a destination with a unique charm all its own. Slovenia is a natural paradise, with a laid-back atmosphere that's perfect for a holiday. As you make your way south you'll get a chance to enjoy some of Croatia's most magnificent beaches and natural landscapes. The lovely city of Dubrovnik is the perfect place to conclude an adventurous yet relaxing two-week vacation. The services we provide as part of our comprehensive packages include accommodations, bus and ferry tickets, transfers and city tours. In addition to the tours included we can arrange a number of excursions based on your own interests. There is also an option to travel between cities by private car or van transfers at an extra cost. Our Destination Manager in the region will provide assistance before and during your travels. They will be available to you leading up to the trip to answer any questions and arrange local services. You will be provided with information on the best these destinations have to offer, including things to see and do, restaurants, entertainment and other insider tips. Upon arrival we will provide you with a local cell phone that you can use to contact our Destination Manager throughout your trip. In all of our destinations we offer a variety of accommodation options, including boutique-style hotels, charming B&Bs and spacious apartments ranging from a three to five-star level. From our first-hand experience we can ensure they are all clean, comfortable and centrally located. We generally discourage chain hotels but provide accommodations with unique features or an authentic feel. When you arrive at the Ljubljana airport, you'll be greeted and taken to your centrally located accommodation. Ljubljana never fails to win over visitors with its charm and natural beauty. Most of the Old Town has been converted to a pedestrian-only zone, so it’s easy to explore the highlights on foot. Today we recommend a two-hour private walking tour with a local guide so you can skip the tourist traps and see the best of the city. You’ll head up to the castle for spectacular views, but also take time to stroll along the river in the center. Ljubljana has a wonderful restaurant and cafe scene, and many great venues are right on the water. Today we suggest venturing into Vodnik Square, where you’ll find an excellent market, with fresh fruits and vegetables, local specialities and crafts that make wonderful souvenirs. The square is easy to find in the center, as it goes from Dragon Bridge to the Triple Bridge. There’s also some interesting architecture here, including the statue of the priest and poet Valentin Vodnik, who gives the square its name. Today we recommend exploring one of most striking parts Ljubljana’s skyline, the Ljubljana Castle. Set on a hill overlooking the entire city, you can reach the castle by foot, bike or funicular. You’ll find a museum that will tell you everything about the history of the city and the surrounding region. This is a great way to get a more in-depth picture of the rich story of Ljubljana’s founding. Tickets are only 10 euro and include a funicular ride back downtown. The view from the tower of the castle is a must-see. On this day the rent a car representative will deliver you the car. It will be the car with an Manual transmission but please let us know if you will need an automatic and we will upgrade for additional fee. The GPS is also available for the additional fee. Slovenia is relatively small, so it’s easy enough to explore. From Ljubljana, our top recommendation is a day trip to Lake Bled and the stunning surrounding area. Here you can spend the afternoon enjoying the gorgeous glacial lake and medieval castle situated on an island. This place is a Slovenian icon, and it’s easy to see why. The entire town has a fairy tale atmosphere that will astound you. It's about a 45 minute drive from Ljubljana so you'll be there in no time at all. You can stroll along the alluring jade water, hike through the surrounding forests, or even pilot a boat to float romantically over the lake. No trip to Slovenia is complete without a visit to this tranquil setting. If you like fish dishes, try the fresh local trout. Other places of note are Vintgar Gorge, a 1.6 km long gorge with steep depths and vertical walls which we recommend visiting after seeing the center of Bled, where you can have lunch and a short walk to take some pictures. Be sure to try rich local cream cake! After the gorge you could visit another even more picturesque and peaceful lake, Bohinj in the heart of the Triglav National Park before heading back to Ljubljana. A morning start is recommended for your drive to Rovinj as there are some fascinating stops along the way. About halfway there, we suggest touring the Postojna caves as well as visiting the nearby Predjama Castle. Built into the side of a cliff, it is a truly marvellous sight. 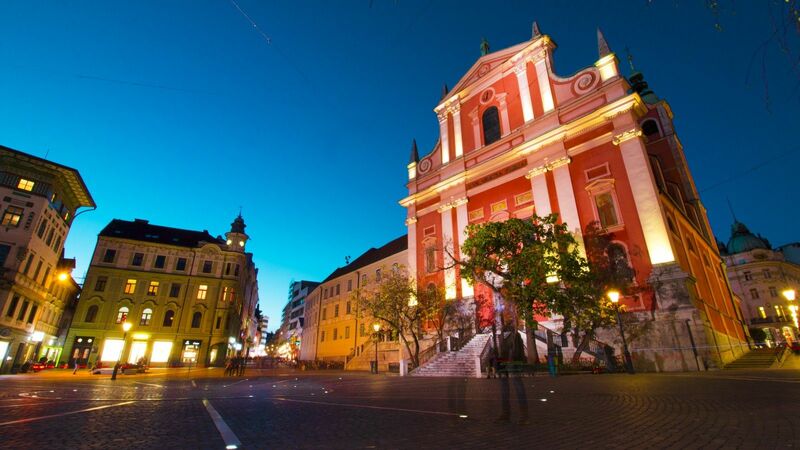 Ljubljana enjoys a central postion which makes it the ideal base for exploring the rest of Slovenia. It is a crossroads culturally due to its location, on one hand you can see the Central European influence from Austria and Slavic countries in the city's architecture and language. On the other hand there is a strong Mediterranean and Balkan influence which is brought out in their laid back approach and the city's cafe culture. People are often surprised how westernized and advanced Slovenia is putting it more in a class with its Austrian neighbors than its Eastern European counterparts. The surrounding areas of the city are packed with natural beauty and cultural sights bearing witness to the city's dynamic history. There is diverse range of places to satisfy culinary desires as the local cuisine is also heavily influenced by its neighbors in all directions. Wine lovers will find Slovenia to be a hidden gem. One of the best ways we have found to get to know Ljubljana and Slovenian cuisine at the same time is on a food tour, which will take you on a gastronomical tour of the whole country while walking around the center. The city layout is tourist friendly as the Old Town has an ever expanding pedestrian zone and a great way to see Ljubljana is by bike taking advantage of the numerous bike lanes spread out across the city. After your sight seeing stops, you'll probably arrive in Rovinj in the late afternoon, perfect to check in to your accommodation. Relax after your drive with an evening stroll around Old Town and the lively harbor area. On your first day in Rovinj we recommend getting a feel for the city with a private walking tour. This two-hour tour will be led by a local guide who knows all the ins and outs of the place. You’ll see all the main attractions including the St. Euphemia Church, the town clock, and Balbi’s arch. St. Euphemia Church is a stunning example of Baroque architecture that dominates Rovinj’s Old Town, as it is built on the top of the hill. Inside you’ll see the preserved body of St. Euphemia from the 6th century. This orientational tour will introduce you to the rich history of Rovinj and all of Istria, as well as Italy’s influence on the region. Optional: Let's go truffle hunting! Croatian cuisine is mostly associated with seafood, but local truffles also play a big role. These savoury mushrooms are some of the most sought-after ingredients in the world. Today we recommend a four-hour truffle hunting adventure near lake Butoniga in central Istria, about 45 minutes from Rovinj. You’ll be picked up from your accommodation and driven to the area, where you’ll start with a welcome drink and a feast of truffle products. Then, accompanied by a truffle hunting dog, you’ll hike to locations where truffles grow in nature, and with a little luck find some of your own. At the end of the day you’ll head back to your host’s house for a traditional dish with your fresh truffles and a glass of Istrian wine. Istria is a region of romance and myth. It’s also so beautiful that it’s often compared with Italy’s Tuscany. But in order to experience the best of Istria, you’ve got to get outside of Rovinj. To do so, we recommend this private full-day Istria tour. From the hills to the coasts you’ll see the best of the region, and also taste some of the local cuisine. This is a suggestion for a private tour while you can easily explore the region on your own with the car you have rented. Lots of options for you as you make your way to Plitvice. You might want to explore more of Istria, so we suggest a visit to Pula. Driving along Kvarner Bay will certainly take your breath away, and we also recommend stopping for a visit to the coastal resort town of Opatija, once the seaside retreat of the Habsburg era nobility. Rovinj used to go by Rovigno, and to Italian-speakers it still does. This city was once part of the Republic of Venice and this is evident from the street names in Italian to the Venetian touches to the architecture. This laid-back spot also has a full cultural calendar, with numerous festivals taking place in the warmer months. We’ll help you get to know the local culture, with possible activities like a local wine tasting, a fish cooking masterclass with a local chef, or a truffle hunting adventure in nearby Croatia. Then, to work up an appetite for your next delicious meal, you could rent bikes and cruise through the breathtaking Zlatni Rt Park. You’ll definitely want to visit the local market too. History buffs will love visiting the local cultural heritage museum, which gives great insight into the region. When you’re ready to get in the car, a day trip to Pula is always fun. This busy port town hosts a large market packed with delectable local specialities, and also boasts a Roman amphitheater. You could even arrange a full-day private tour through the gorgeous region of Istria, where more delights await you inland. Have a leisurely drive from Rovinj to take in the sights along the way. We'll advise you on how best to reach your Plitvice accommodation and with a later afternoon arrival you'll be perfectly timed to check in and relax. There are many interesting stops on your way from Plitvice to Trogir today. Our suggestion would be to stop and visit Zadar town, famous for the unique sea organ and greetings to Sun. The other stop would be Krka Waterfalls, another national park very close to Trogir. If you make any of these stops you will probably arrive in Trogir in the later afternoon, a perfect time to check in at your accommodation. The Plitvice Lakes are one of the most beautiful natural settings in Croatia. A visit here is always a joy. The national park has been UNESCO-listed as a World Heritage Site since 1979 and it’s easy to see why. You’ll find 16 lakes here in a stunning array of colors. Surrounding the lakes for 200 miles, the park has numerous hiking trails and plenty of places to appreciate the scenery. The lakes themselves stretch across five miles. This is nature at its most untouched! You'll most likely arrive in Trogir later in the afternoon, in time to check into your accommodation. Then relax for the evening with a stroll through the Old Town and along the beautiful port. A 30-minute drive to Split will begin your day. At the port, you'll drop off you rental car and then we suggest storing your bags and exploring Old Town for a few hours. You can read more about Split on our website. While in Split, we will provide tickets on the ferry to Hvar, about a 1-hour journey. The port, bag check and Old Town are all within walking distance of one another, so you'll easily manage. Trogir is has been called a city museum. With a history stretching back more than 2,300 years, there’s something ancient everywhere you look. History, culture and architecture comes together in the oldest part of Trogir, an island surrounded by city walls. You’ll see traces of Roman, Greek and Venetian art and design here as you wander the quaint streets and narrow alleyways. Combine this charm with the beaches and lush green hills that surround Trogir, and you’ve got a picture perfect holiday destination. You’ll love relaxing as you explore the city, and enjoy day trips to national parks, wineries and beautiful coastal towns. There’s much to do in and around Trogir, and the activities perfectly balance the city and the lovely beaches of nearby Ciovo. After learning more about the history of the city and seeing its most impressive sites with a local guide, you can enjoy fine Croatian cuisine at the city’s best restaurant. From fresh seafood to grilled specialities, Croatian cooking is always robust and full of flavor. 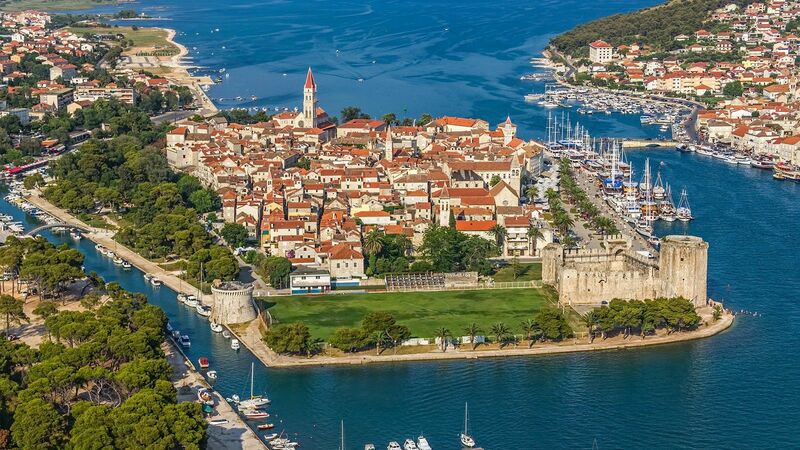 Trogir is situated near some of Croatia’s most pristine national parks. The UNESCO-listed Plitvice lakes are breathtaking, with emerald water and natural wonders. When you’re ready to venture farther afield, you’ll also want to visit the Sibenik and Krka waterfalls, a full-day trip that will have you relaxing in an Edenic setting. This is a wonderful place to unwind. Upon arriving in the port of Hvar, you will be met and brought to your accommodation. There are numerous vineyards and a long history of winemaking in Hvar. Today we recommend getting a taste of the local vinous culture, with a fully guided four-hour wine tasting tour. You’ll stop at two wineries, where you’ll taste six different wines, along with two dessert wines. The tour is designed to be informative, and above all, fun. One of the best-known characteristics of Croatia is the deep blue water off the coast. We recommend getting more in-depth, literally, with an eight-hour blue cave group excursion. After a brisk trip by speedboat you’ll arrive at the islet of Bisevo, the location of the Blue Cave, a natural phenomenon that can be entered only by small boats. Here you’ll admire the play of light off the water, before continuing on to the fishing village of Komiza, where you’ll have free time to swim and explore before returning to Hvar, with the possibility of a stop at the Pakleni archipelago if time allows. Hvar is Europe’s sunniest island, a gorgeous combination of beaches and olive groves, fisherman and grape growers. There’s plenty to see, and a full-day off-road excursion is the perfect way to see it. You’ll be treated to an off-road tour through typical old villages, combining amazing scenery with authentic local charm. The unspoiled nature, panoramic views, and luscious groves are a sight to behold. You’ll enjoy the tour with your own local guide, stopping for a delicious lunch of Croatian delicacies along the way. Today is a great day to charter your own boat and skipper to explore the Pakleni archipelago, with white sand beaches and quiet villages with delicious local restaurants. With your own boat, you’ll be able to make your own itinerary, exploring the many hidden coves and the picturesque coastline at your leisure. It's an early start today for the only departure of the day to Dubrovnik, the city on the sea that you've heard so much about. Skipping a length ferry ride to Split and then a bus ride down the coast, instead you will speed along above the waves on a catamaran ferry. You will reach Dubrovnik around midday, so you'll have plenty of time to explore in the afternoon. Alternatively, if you would prefer taking the opportunity to sight see along the way, we recommend our private transfer option. For an additional fee, we can arrange for a private driver to pick you up in Hvar and bring you straight to Dubrovnik. If you choose, you can stop along the way, perhaps to explore Ston, the oyster capital of Croatia, on the Peljesac peninsula. One of the gems of the Adriatic, Hvar is more than a beautiful coastal town. It’s also an ancient epicenter of culture, boasting the oldest communal theater in Europe, the largest square on the Croatian coast and a stunning medieval fortress dating back to the 7th century. There’s a little bit of everything here, from history and architecture to modern culture, outdoor adventures and isolated beaches. Whether you want a vacation that’s action-packed or something more relaxing, Hvar -- named one of the top 10 world summer party spots by MSN -- will offer more than enough variety to please you. The longest of the Adriatic islands, Hvar’s fertile landscape makes it perfect for growing grapes, giving you several local vineyards to visit. Be sure to sample the local cuisine, which emphasizes freshly caught fish, baked bread and vegetables grown on the island. We can offer a tasting tour at the finest local vineyards. Those seeking an active vacation will not be disappointed either, as there are several possibilities for sailing, swimming, exploring the sea caves along the coast. You can also take a hike in the hills overlooking Hvar, and go offroad with a local guide. This is a relaxing destination with warm locals. It’s an ideal summer vacation spot. We will arrange to have someone on hand at the port to greet you as you get off the boat and then transfer you to you Dubrovnik accommodation. Dubrovnik is truly a gem of the Adriatic. The city has been on UNESCO’s World Cultural Heritage List since 1979. We recommend taking a private 1.5-hour walking tour of the Old City that will show you the old city including the elegant main street and its most important sites: The Franciscan Monastery, Onofrio’s Fountains, Sponza Palace, Orlando’s Column, City Bell Tower, Church of St Blaise, and Rector’s Palace. It’s an ideal way to get oriented in the city and set yourself up for further exploration. Continue your day in Dubrovnik after the tour with a ride on the cable car up Mount Srd' to take in the views or get another view of the town by walking the ancient walls that surround the city. If you'd prefer to see Dubrovnik from afar then take a boat trip to Lokrum Island, an oasis of nature and tranquility just 10 minutes from the old town harbor. Let’s get the adrenaline pumping today, shall we? A sea kayaking excursion or a buggy adventure are two great activities we highly recommend. The Buggy Safari is an hour-long excursion that lets you drive off road to see wildlife, fortresses, former minefields and war sites. It all culminates in a dramatic 360° view of the entire region from Srd mountain. You’ll be picked up from your hotel and driven to the off-road site, then you’ll enjoy lunch in a local restaurant. If you’d rather explore sea than land, a three-hour sea kayaking excursion is your best choice. You’ll paddle along the walls of Dubrovnik, getting a new view of the city, then go for a swim in one of the secluded coves, where you’ll really become one with nature. Your kayak is equipped with a water-tight barrel so you don't need to worry about your valuables or camera getting wet! If you have a taste for great food, we’ve got the perfect day for you if you opt for this cooking class. Today you will head out into the Konavle countryside. Here in a 500-year-old farmhouse, you’ll have a half-day cooking class that will teach you about local gastronomy as well as Croatian culture and history. Start by picking fresh vegetables from the garden, then prepare a four-course lunch or dinner with an expert chef. When you sit down to dine, you’ll also have excellent local wines and brandy. It’s a great way to get hands on with Croatian gastronomic culture, and have a great time doing it! If you need our local staff can arrange for transfers both ways, if you don't have a designated driver. Today why not explore the Elaphite islands with a private speed boat and skipper at your disposal? You can enter and see some of the Elaphiti hidden caves, swim on sandy beaches and visit villages on the islands. Take a walk on the island of Lopud, with two monasteries, 30 churches and a number of ruined noble buildings. This tour is perfect getaway from the busy old city center and a great example of typical Dalmatian island culture. Beautiful spots for swimming, sightseeing, walking or just enjoying the sun on the boat or on the beach is all this day is about. Today, why not spend a day exploring some of the finer things in Croatian life, like wine, seafood and boats. Oyster fans should undoubtedly head for Peljesac, renowned for having the best oysters in Croatia. You’ll see the gorgeous scenery and blue bays of the Peljesac peninsula, where you’ll taste excellent wine from Croatia’s most famous wine region. You’ll stop at two wineries for tastings and take a 10-meter boat to an oyster and mussel farm, where you’ll have a light lunch of excellent, fresh shellfish. A driver will pick you up at your Dubrovnik accommodation and drop you off at the airport for your departing flight. Dubrovnik offers an unusual blend of modern culture and ancient tradition. Marble-like polished limestone streets, a labyrinth of alleyways and breathtaking architecture compose the unique atmosphere of the Old Town. You’ll experience a true variety of sightseeing, leisure and outdoor adventures here. Dubrovnik’s most stunning feature is the 82-foot tall city wall which extends more than a mile. Game of Thrones fans will be in luck, as we offer a special tour to local set locations. King’s Landing never looked so good! There’s a rich selection of live performances for music lovers here, as concerts are performed daily, and in July and August the Dubrovnik Summer Festival of music, theatre and dance brings incredible performers from around the world. The nightlife is also exciting, with restaurants, cafes and bars that will keep you socializing until dawn. You’ll be staying in beautiful accommodation within short walking distance to all the major sites, so you’ll be able to sample a little of everything. But there are also several exciting day trips and cruises to enjoy. From kayaking through hidden coves to an authentic Croatian cooking class, vineyard tours, and trips as far afield as Montenegro, you’ll have more than enough to fill your itinerary. JayWay Travel took all of the stress away from this trip. It all worked like a fine tuned machine. We have not regretted for a moment, we entered the Jay Way world. Within minutes they had sent us an itinerary for our proposed trip and later gave us several selections for accommodations at various levels of comfort. We saved ourselves hours of self inflicted searching, pondering, reserving and unnecessary risk. We were comforted greatly at the transition points, i.e., being met as we arrived at each location, having a city tour to orient us to each city, and then transport to either the train station or by shuttle to our next destination. We recommend Jay Way Travel without any reservation. The time, energy, and effort they saved us was worth every dollar of their fee, which by any accounts was very reasonable. Everything was excellent. You have set the bar so high I’m not sure anyone can compete! Personalized service that far surpassed our expectations. This was not a one size fits all vacation but one that was curated for us. JayWay Travel is very professional . They take the stress out of traveling. The people that we worked with were fabulous. Thanks to Lea for always going the "extra mile". JayWay Travel made our experience be the best ! "JayWay did it all! Impeccable! Couldn't be any better. It was more than we expected." Excellent. If you want to design a tour for your personal interests it is the only way to ,go. Don't bypass the Baltic States! JayWay will make sure you have the best experience. If you want to see the best of Croatia or any of the former Yugoslavia, don't hesitate to contact JayWay. It's personalised to your interests and you will not get better service on the ground. "JayWay staff provided us with everything we needed and more. We loved being able to be in contact with them and we appreciated hearing from each throughout our trip, making sure all was well. Knowing we had these contacts was reassuring. Your activities were amazing! All JayWay staff worked wonderfully well with my wheelchair needs to ensure that I saw all that I could and taking Molly to do some things I couldn't. Your selection of choices was excellent, and we truly loved everything we did. JayWay provided an amazing experience, covering all aspects with expertise, to make an outstanding trip and taking care of us so well the whole way through. Thank you!" "The staff person who helped us plan the itinerary, was enormously helpful, knowledgeable about how to plan the trip; how long to stay in certain places, etc. He was also very patient when we made changes to our itinerary and/or our accommodations. We literally couldn't have planned the trip without him. An enormously helpful, informative, travel service that is essential for anyone traveling to countries they are not familiar with." "If you're visiting Croatia, and you should, JayWay will put together a great trip for you and then will be there for you every step of the way. Carmine was great, put together the perfect itinerary for us. We felt we were in good hands with Lidija. Very responsive." "Very prompt answers to all of our questions. Recommendations were on point. Carmine was very helpful in narrowing down our trip so that we could get as much in as possible in 11 days while not stretching ourselves. Our contact was extremely helpful and checked in on us throughout the trip making sure we were happy with hotels etc. All transfers went smoothly and perfectly on time. All of our tour guides were great. Very informative. Perfect. Couldn't have been happier." "Jayway Travel is an excellent option for those who are looking for guidance with a difficult-to-plan vacation but aren't interested in group or guided tours. Having on-the-ground experts available and reachable via a provided cell phone is an extremely valuable offering that is difficult to find with other tour companies." "JayWay allowed us to have our self-guided vacation with just the right amount of support. We could use the resources at our disposal as much or as little as we wanted. JayWay is a finely tuned machine." "Jayway made us feel looked after in a way that allowed the logistics of our trip to be in the background so that the enjoyment and adventure could be the primary focus. Pavla was just wonderful! We felt so at ease knowing she was available if needed. This was maybe the most helpful aspect of using Jayway, knowing that someone was coordinating all of the transport in our behalf made this trip doable." "We have recommended JayWay to several friends. It was one of the best trips we have experienced and between us, Alan and I have seen a lot of the world. In 2017 traveled 30,000 miles." "Jayway was with us from start to finish. We chose them because we were unfamiliar with Central Europe, and before long their online resources and our private portal allowed us to plan and dream with excitement. Each step of the way, we felt cared for, both in the preparation process and when we arrived at our first destination. Each driver, guide, and on-site coordinator seemed thrilled to be working for Jayway and provided top-notch service on each leg of the journey. The private cell-phone, the frequent check-ins, the personal service: all made our trip easy and memorable. In many cases we became friends with our guides, who treated us as worthy travelers rather than mere tourists. I look forward to partnering with Jayway on our next trip and will recommend them to any friends who contemplate a trip to Eastern and Central Europe. Bravo, Jayway!" "I hate group tours. Jayway was entirely different. Their advice was invaluable in selecting the right accommodations, the right tours, and the right schedule. All in, Jayway is the perfect trip planner. You get the vacation YOU want – not a pre-packaged tour that only hits the highlights - but all the difficult details are taken care of. I tell everyone – “Don’t go on a cruise to see Croatia. Use Jayway”. " "JayWay was a fabulous way to travel—essentially assisted independent travel, with great staff, itineraries, hotels, transportation, transfers, restaurant suggestions, and optional tours. Having someone to consult with a few weeks before the trip and a local cell phone and someone helpful to call if we needed anything made it perfect." "I've been organizing travel for my friends and family for years and I've never come across a company that put so much effort into details. We always felt like we had a lifeline in places that were all very foreign to us. I have the highest regard for Jayway. They treat their family right and the result is top notch quality. Everyone went above and beyond any expectations!" "JayWay provides an enormously helpful array of resources and services that eliminated all of the stress of traveling. From the first contact to the final ride to the airport every encounter with staff was welcoming, professional and extremely helpful - a great service. Ana, Bettina, Lidija, and Josipa were amazing. Responsive to all our needs, caring, helpful, committed, and connected with lodging hosts and drivers. We were continually amazed at the cooperation and coordination of the JayWay Team." "I really enjoyed my experience with JayWay. Very helpful and accommodating company to work with. I always felt safe which is important traveling alone! Kayaking was a highlight and people I met on group tours." "Carmine was very responsive and attentive to our requests. He made changes to our itinerary as requested and Lidija was incredibly helpful every step of the way. She gave us a cell phone to contact her during our week's touring. She provided us with electrical adaptors to use over there. She checked in with us during the week. The local tour guides provided were extremely knowledgable. From the first contact to arrange an itinerary through to the last stop on our week-long tour of Croatia, JayWay provided professional advice, excellent accommodations, quality tours and knowledgable tour guides. I would recommend JayWay to anyone traveling to Croatia without hesitation!" "Our experience with JayWay Travel was so special, so memorable and exciting that two days into our eleven day trip we started making plans for our next vacation with JayWay! I hope that I never forget a single moment of our 11 day trip through Croatia; each one was so special, each activity so memorable...I can't possibly imagine a better honeymoon. If I had to choose a favorite experience, it would be our second day in Dubrovnik, we kayaked around the city walls and the island of Lokrum in the morning and then took our cooking class that night. As for my husband, I believe his favorite memory would be our Game of Thrones walking tour that included so much more history than we were expecting. " "Interest and response of staff to questions and requests was outstanding. Very friendly and helpful. Their communications with drivers, etc. enabled seamless transportation and transfers. City tours of 1.5 - 2 hours were the right length with good informative content. Recommendation for travel-day stops were very good. JayWay applies their knowledge of the country to help guide an outstanding trip. Services and transfers arranged by their attentive staff are executed easily and on-time, making the travel experience easy and pleasant." "We have just returned from our Croatia trip and I wanted to thank you, personally, for arranging a first class vacation for us. Everything went off without a hitch and the tours, drivers and hotels were outstanding. I am so glad that I took your advice and did Ljubliana as it was one of our favorite stops. I hope to go back some day and do more of the country, so will be in touch when that happens. Thanks again, Sherry"
"It was an excellent trip overall and having the accommodations booked, transfers arranged and the use of the phones and a person to contact at any time, was great. It took away the worry of travelling in a strange country where English was not the first language." I was very impressed with the service provided, starting with the agents with whom I liaised regarding our trip and tours, as well as all the people who provided services in-country. Everything was perfectly organized and went like clockwork - tours departed and returned on time, transfers were always punctual, accommodation was great - everything was perfectly organized. "JayWay made our first trip to Central Europe and the Adriatic a wonderful experience. From accommodations to transportation to restaurant recommendations, to personal guides, their arrangements and suggestions were outstanding. We'll certainly use JayWay again and will enthusiastically recommend them to our friends and family. On our last night in Dubrovnik, my husband, who's very particular and wasn't convinced that he even wanted to take this trip ('Croatia???') said: 'This was the perfect vacation. Best we've ever had.' Thank you JayWay!" "We were so impressed with JayWay and everyone we worked with from the beginning planning stages to through the trip. The communication, responsiveness and professionalism of everyone at JayWay was excellent. The hotel choices were great, always well located, the touring suggestions very helpful, overall a wonderful experience." "We had such a great customer service experience with JayWay. Nothing about our honeymoon could have gone any more amazing than it was in reality! We had the time of our lives and are already planning out next trip plans and hope to be able to go by 2018!" Caitlin also posted a number of photos from her honeymoon on Instagram, we've featured a few of them here. "We tell everyone that it was one of our best trips ever and that Jayway made it so. No Stress. It was a perfect experience. Much more like a vacation than a trip because you took care of all the logistics. You have a great business model. I wish there were more companies like yours that cover other parts of Europe." "We had a great holiday in Slovenia and Croatia thanks to JayWay Travel. Right from the planning stage then working out the local arrangements, to on the ground support. Once there, Antonia was like a personal tour manager, always monitoring our progress and ever ready to help with anything we needed assistance with." "I already raved to so many friends, because quite simply it was the BEST, to venture into a part of the world quite foreign to each of us was made a wondrous adventure, we were in capable hands with everyone we encountered." "The trip went so smoothly it was the most perfect honeymoon. Everyone we met and/or assisted in planning our trip was very helpful. JayWay gave us excellent customer service, fantastic accommodation, and a great vacation at a great price." "We will continue to recommend JayWay to our friends! This was our second time using JayWay to plan our Eastern European trips, and we could not have been more happy or satisfied!!! Thank you JayWay!" "We loved our accommodations. Each place had something special whether it was the location or the actual ambiance of the place itself. The owners love working with Jay and spoke highly of him personally. Met some other nice JayWay travelers and enjoyed their company as well. I have traveled extensively and this trip was one of the easiest and least stressful that I have experienced. We had the best time. Thank you." "JayWay took a lot of hassle out of the trip and gave excellent guidance & suggestions in finalising the individual cities on our trip. This was clearly based on considerable experience with each of the countries. We particularly loved the transfer service at each location. It was most welcome when arriving somewhere tired and not knowing where to go! The local contacts also provided outstanding help and guidance on the road and the mobile phone was a great idea." "We had wonderful experiences with every single lodging, which is very unusual. The services you arranged all went very smoothly. Everyone we met was very welcoming. Croatia is a beautiful, interesting, historic country. We thoroughly enjoyed the trip and all the discoveries along the way." "JayWay made our honeymoon planning so carefree: once we got to Croatia we knew everything was already taken care of! We enjoyed all of the extra excursions and insider knowledge suggested to us as well as all of the hotels and apartments we stayed at. To think of planning a trip of this magnitude while also planning my wedding was overwhelming. I am so very thankful for JayWay and the team that helped make our honeymoon so memorable." "JayWay made our trip to Croatia and Slovenia effortless. I appreciated the time they took to work out an itinerary that fit within my budget without compromising the overall experience. The "little things" like delivery of ferry tickets that could not be purchased in advance and provision of a local cell phone ensured that there wasn't a single problem while we were on the road." "Our honeymoon was great and JayWay was there to assist us and make the trip stress free. Even when we were late showing up for the kayak excursion (thought it was an hour later), JayWay's local representative called and reminded us of the time, as well as arranged for the kayak operator to wait for us." "We had an amazing trip seeing the incredibly beautiful country of Croatia. Being met by prearranged cars, being handed our ferry, and bus tickets, and having access to your local representative made the trip very easy for us. It allowed us to just have fun, and enjoy the culture and our experience in Croatia. A 10 out of 10 for sure!!!" Please note, no particular accommodation is specified in the package. The price you see on this proposal is based on estimated costs of 3 Star accommodation, or next best available class, in each destination. The total package price will depend on the accommodation you choose.